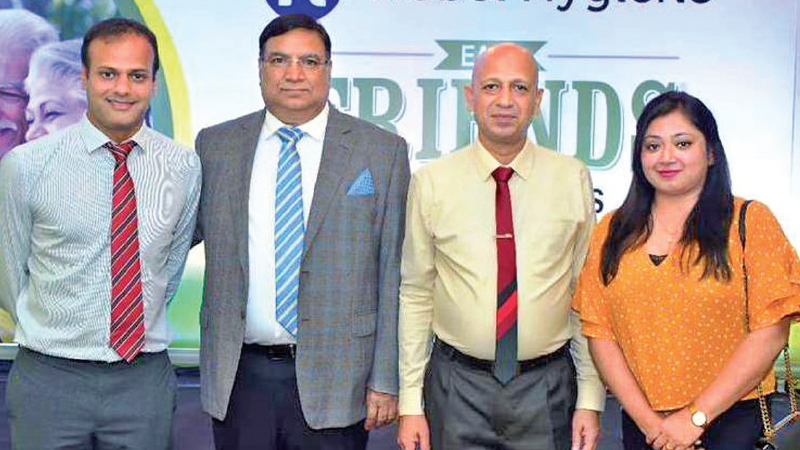 Sanjeev Rajarathnam , Managing Director, Darley Butler & Co. Ltd., Kamal Kumar Johari, Founder/ Managing Director, Nobel Hygiene, India, Rasika P. Hirimuthugoda, CEO Healthcare, Darley Butler & Co. Ltd., Jinu Thomas – Manager Exports, Nobel Hygiene, India. Darley Butler & Company launched Friends Adult Diapers in Sri Lanka. Darley Butler & Company, joined hands with the Indian giant in diaper manufacturing, Nobel Hygiene in this venture. Friends Adult Diaper is truly a friend, who can enhance the comfort and confidence, in the lives of those adults, who need extra support. Friends Adult Diaper, the launching ceremony of which was held recently at the Hotel Galadari, Colombo, has made a mark as a high quality brand and enjoys a high customer loyalty by offering a range of unique features. “Friends Adult Diaper is a product with Anti-bacterial protection along with High Absorbency, Wetness Indicator, Leak Guard and 8 hours’ protection to enhance the comfort and confidence of the users” stated by Founder and Managing Director Kamal Kumar Johari. Millions of senior citizens have embraced an active lifestyle with dignity after using Friends. Doctors recommend adult diapers for patients with prostate disorders, piles, incontinence, urology problems, and diabetics. It is also used by patients who are paralyzed, bedridden or disabled. Nobel Hygiene (Pvt.) Ltd.’s main product, Friends adult diaper holds 72.5% market share in India and it is exported to more than 15 countries including USA, Australia, Netherlands, Kuwait and Kenya. With 18 years of experience and a state of the art manufacturing facility spanning over 40 acres, Nobel Hygiene is the largest manufacturer of disposable hygiene products in India. Nobel Hygiene can boast of the most sophisticated manufacturing plant which produces 9M adult diapers and4.5M under pads monthly. The company has received many quality certificates including ISO 9001:2015, WHO-GMP and European Standards CE. To mark the corporate commitment of Darley Butler Healthcare a financial contribution from each pack they sell goes to HELPAGE Sri Lanka whereas, their main objective is to improve the quality of life of all senior citizens in Sri Lanka without discrimination. Friends adult diapers specially designed to suit Indian and Sri Lankan body types, have unisex designs and are available in three sizes.